Need a quick and easy no-bake dessert? 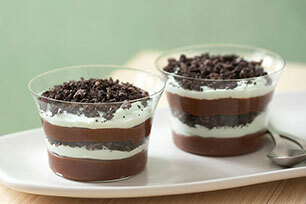 These chocolate-mint pudding parfaits are assembled in minutes. Beat pudding mix and milk with whisk 2 min. Let stand 5 min. Meanwhile, stir food colouring into Cool Whip until blended. Combine chopped cookies and mint patties. Spoon 2 Tbsp. pudding into each of 8 dessert glasses. Top each with 1 Tbsp. each Cool Whip and crumb mixture. Repeat all layers. Refrigerate 30 min. Prepare using Jell-O Vanilla Instant Pudding.